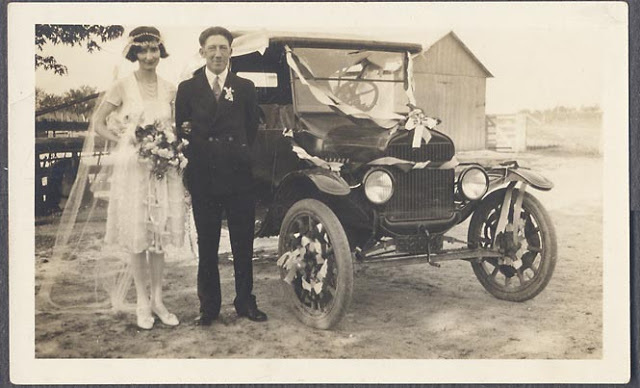 I have noted over the years wedding photos here featuring model Ts and always love to see them. 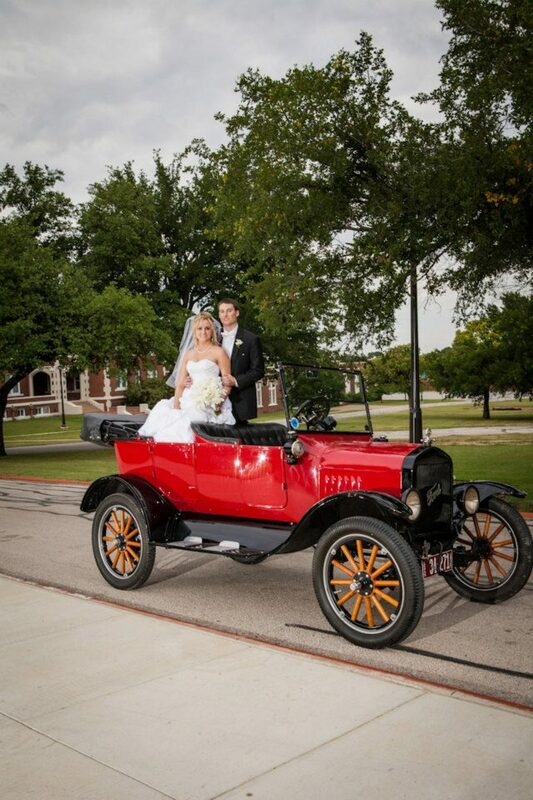 Now that I have been invited to have my car involved in a wedding (friends daughter) I would love to see as many any wedding model T photos you have and hear of any ideas you may have seen or heard of. Erich, I've got a few scars. And no, getting hit in the head doesn't make you smarter. She sure was a pretty bride. I know Danial. My shoes are size 12. My Dad always told me my mouth was what was gonna keep me in trouble. And it seems like most of my life I've proved him right. But doggone it she's a good looking lady. I want images yes, but also ideas of what worked for you or what didn't work involving the use of your T in a wedding. 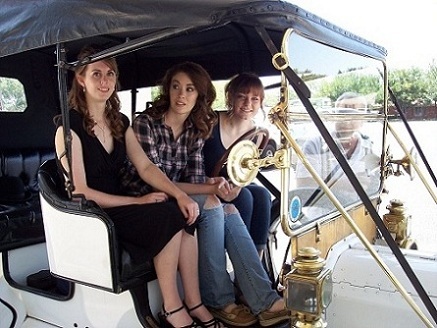 I do think it would be a hoot to have the bride crank it to start before I drive off with the newlyweds. I know I do not want folks "decorating" Lizzy with who knows what. Maybe a few cans tied to the spare tire dragging behind. Jim, I had the same idea. Thank you. Any stories would be great as well. Found a guy in Florida who operates a model T chauffeur business. The full package is picking up the bride and her father (or whoever walk her to the alter) and driving them to the church. Waiting outside during the ceremony, then driving the newly wet to a photographer or a location for photoshoots while the guest drives from the church to the reception. 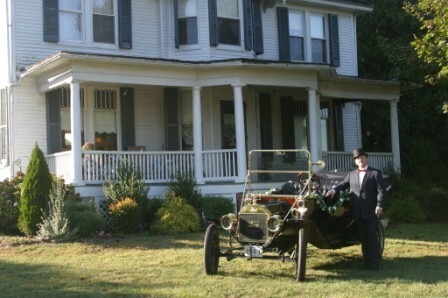 Then after the photoshoot - drive the newly wet to the reception.This must be timed so that all guests have arrived. Same applies if there is no photo session - then we take a ride in the neighborhood. Keep in mind these moments in your car will be the only moment the pair have just to themselves (and you) until bedtime. Let them enjoy before the chaotic reception and eventually dinner. Michael, great info. 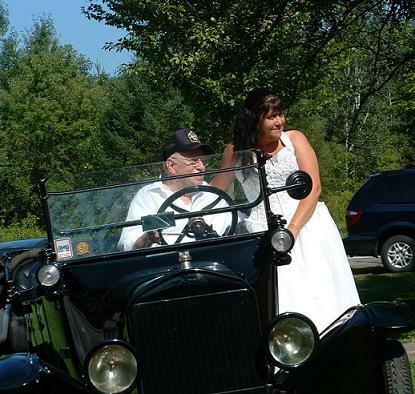 I hadn't thought of picking up the bride and father. Not sure if they will want to do photos before or after. Much to be determined yet. I believe it will be held in the outdoors in a grassy area. I just hope the ground will be firm and not still soggy from our winter rains. Can you imagine getting Lizzy stuck in the mud with the couple in the back? Slinging mud onto the dress would be a big no-no. 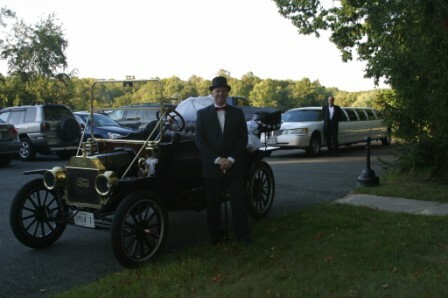 My Touring provided transportation to a wedding recently. 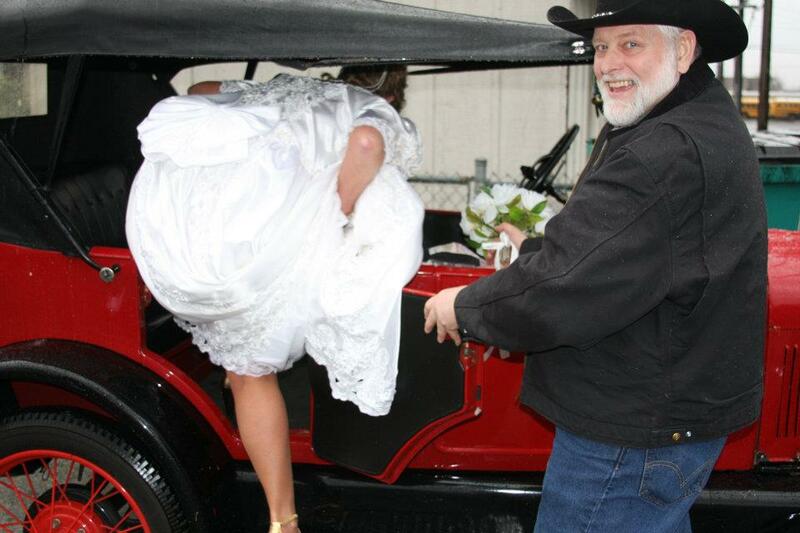 I had to help the "Bride" get into the car! Well be careful if you tie boots and tin cans to the rear of the car. Back in 1969 when my cousin got married his father and I tied cans and boots to his brand new car and the strings were too long and the boots and cans bounced off the road and chipped the heck out of the paint on the trunk! I have never taken the bride and father to the church but I have picked up the newly weds after the ceremony and taken them to a special area where the groom wanted to have some pictures taken and then to the reception after we thought all the guest would be there. When you take the pictures that include the car some should be taken that give a good view of the entire car, just for future viewers that would like to know what the car looked like. 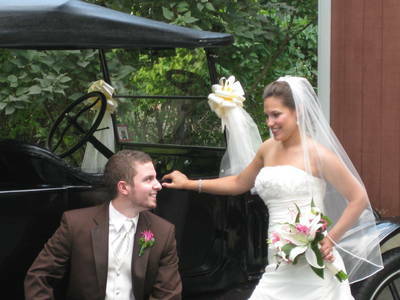 Often the bride or the groom has chosen your car because they liked the car. 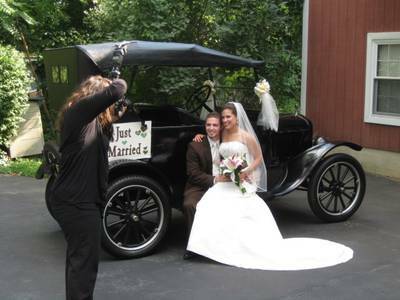 They may like pictures of it with the newlyweds standing, or sitting, so they can be seen as well as most of the car. 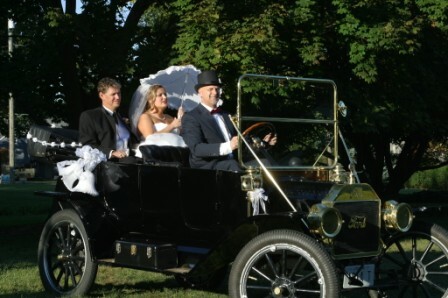 Our local living history museum, Fort Edmonton Park, had a 1920s-style wedding as part of their programming a few years ago. Costuming reflects the influenza epidemic in our city at the time. John, that picture makes me laugh every time. Dennis, Aaron, thanks for the details. I'm looking forward to it. Be sure she uses proper cranking technique. 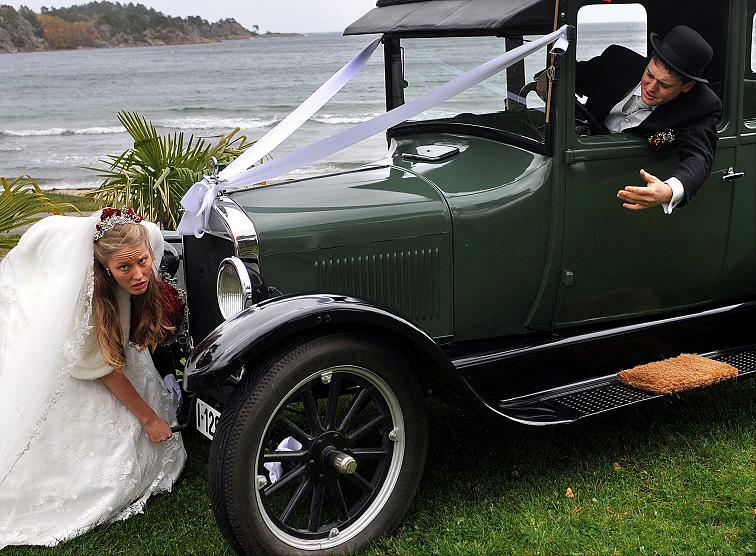 We've used our Model T, Model A, and '42 Tudor as wedding cars for family and friends. Most wanted the cars in front of the church, then transportation to pictures and the reception. My niece wanted to leave the reception in the car also. One of the most memorable shots was the couple looking out the rear window of the '42 mimicking a shot from their grandparents wedding during the war. 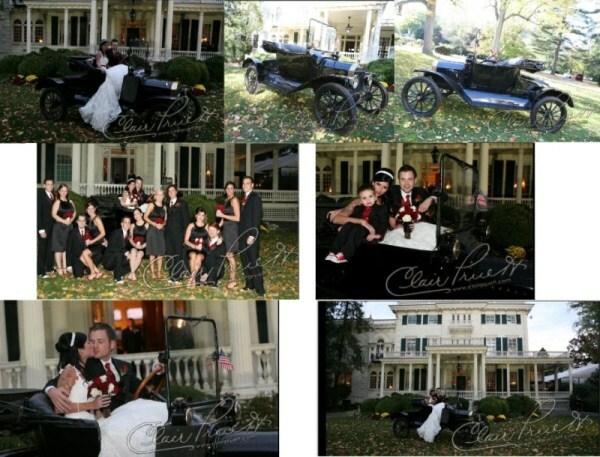 I've also found the photographer usually knows how to incorporate the car, but a couple shots showing the whole car with the couple are usually good momentos, my nephew had one of their pictures with the Model T blown up to "painting" size and they have it hung over their mantle. Chris, that is very unique. Who knew. At first I thought OSHA was around all those years ago. Steve, good point. I wouldn't let her do it without correct instruction and practice. Wayne, that sounds great. Do you have a photo of the one they used over the mantle? A good photo is to have the Bride and Groom looking back, famed by the back window. Works especially well in a closed car. Just watch for unintended reflections. 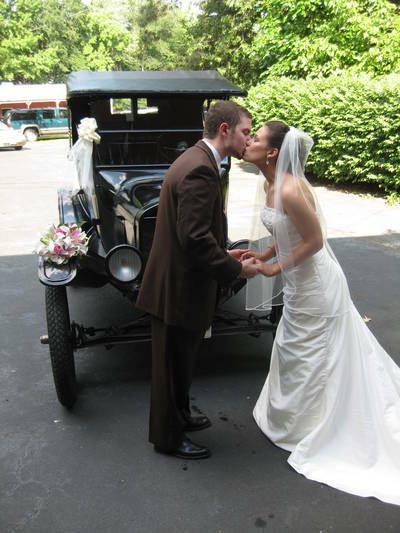 I have done many weddings in my old cars and have learned a few things. Most of the time there was never any issuses but I have found never to assume anything. First check with your insurance co. You may or may not be covered At the wedding keep a close eye on your car at all times you would be surprised at what could happen if the best man or groomsmen deside to play a last minute trick or if the go overboard decorating your car (sometimes alcohol is served at thease things) or all the kids think your car is a jungle gym. It's also good to have a meeting before the wedding with the planner as to what your role is. Same goes if there will be professional photographer, they often have a plan as to how they want it done. I know this is all common sence stuff but you would be surprised ... and sorry really won't fix it if things get out of hand. The first photo above was taken in Norway at Lorentz and Helene Lorentzen wedding. I found a big white bow that we used on the spare tire for my nephew's wedding, they didn't want any other decorations - the car as it was is what they wanted. I was honored that they wanted me to ride too - so that she had help getting out of the car after we left the reception and took them to their car. I would discourage the idea of riding in the car before the wedding - too many things can happen in a open car - namely hair and makeup that hours have been spent on. These first two are from my nephew's wedding. 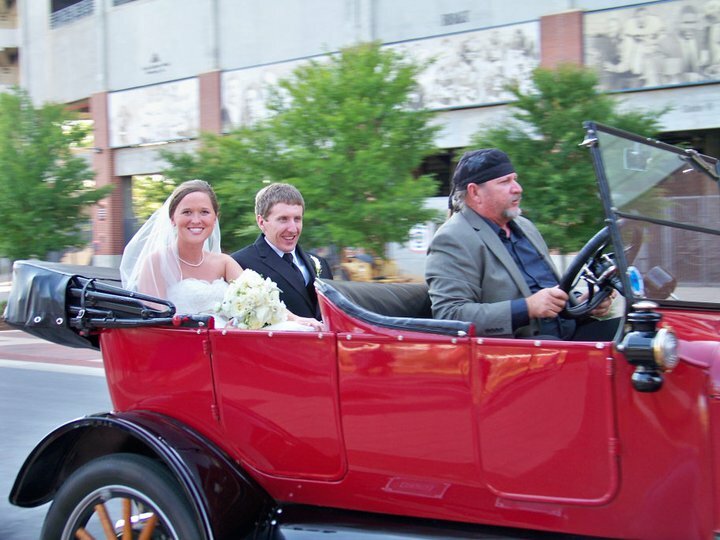 I'm not a college football fan - the wedding took place on the Auburn University campus; it wasn't until be parked it in one of the foyer areas and went upstairs to the reception did I fear for our car. . . it's red & black! The big white bow was purchased at Party City (a local warehouse store) and gave the perfect touch. The funny part - we dropped them off at their car that was parked on campus because their hotel was too far to drive in the dark. I forgot that the bow was back there. 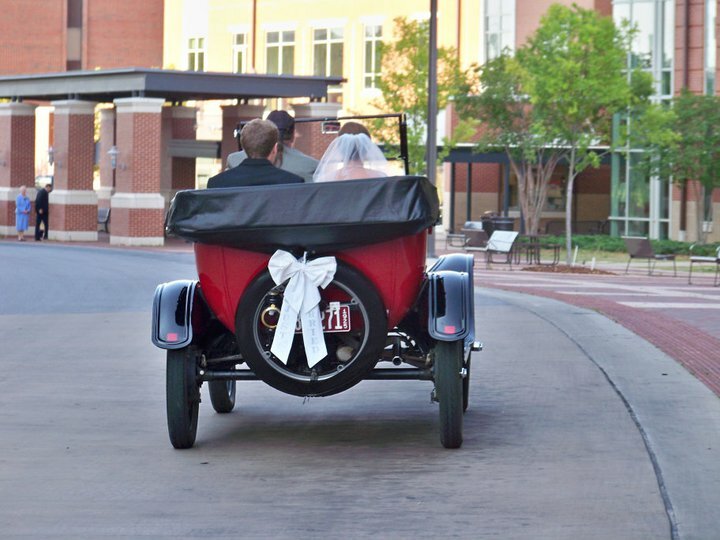 We drove back to our hotel after dropping off the kids, cars kept honking and giving us thumbs-up, it wasn't until someone yelled "Congratulations" that I realized the extra attention was because everyone near us thought we just got married! These two were from our daughter-in-law's best friend. 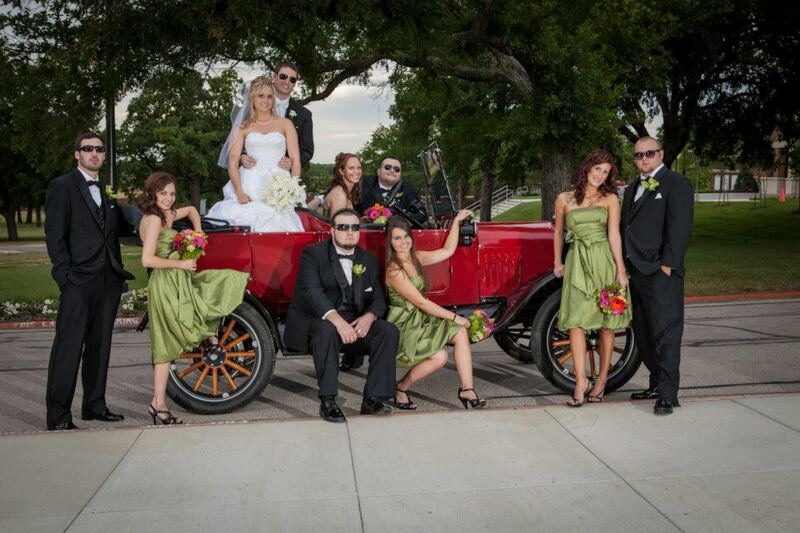 We cleaned the car up the day before and then trailered it to Fort Worth the morning of the wedding. We detailed it once we got there, so remember to have cleaning supplies with you. 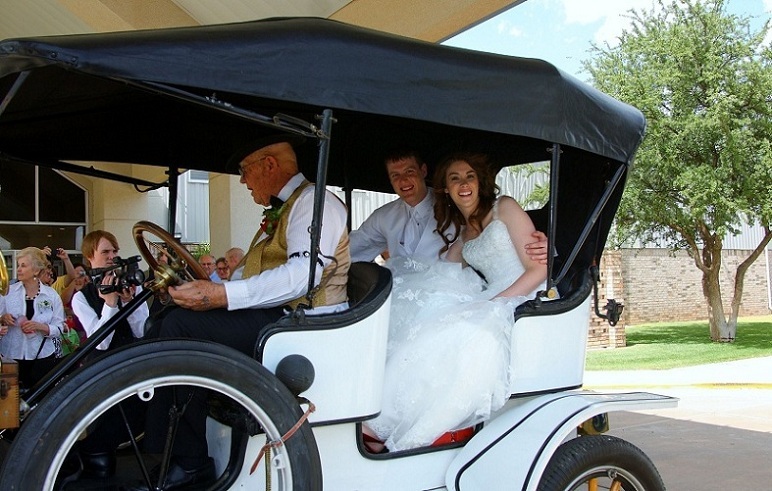 I also bought a white cotton bedspread from WalMart for $25.00 and used it on the back seat for them to sit on - so that any road funk wouldn't transfer to the brides dresses. The last picture has the full wedding party. The guys had sunglasses for their "fun" photos, he we staged all of the couples, I think it's one of the most beautiful shots. Ahhhh....to be young again. Great pics, guys and gals. Looks like a lot of fun was had by all. These are great and lots of good info from those who have done this before. Thank you one and all. I get asked a couple of times a year to do a wedding. In fact I am already booked for one next year. 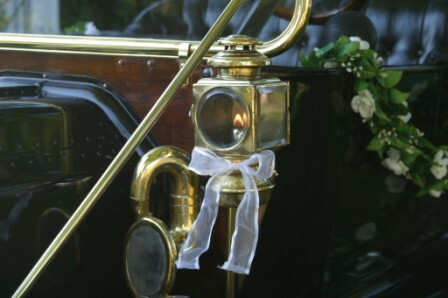 I use my 12 tourabout so weddings take a lot of brass polishing. If I know the kids getting married I usually do them for free. If I do I tell the groom that if he wants me to haul them at the wedding they will have to polish the brass and there is a lot of brass to polish on a 12. I also make if a practice to always tell them they must have a follow up car behind in case of car trouble. A picture from our wedding, four years ago. This was taken in my 20, since then my wife has taken this car over. It is now her summer driver. 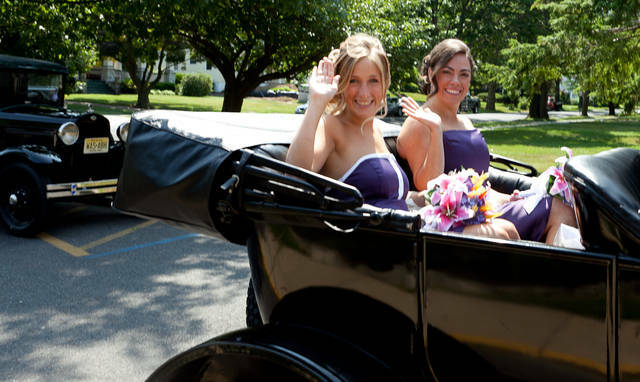 You may want to get a picture of the bride and bride maids in the car before the wedding. 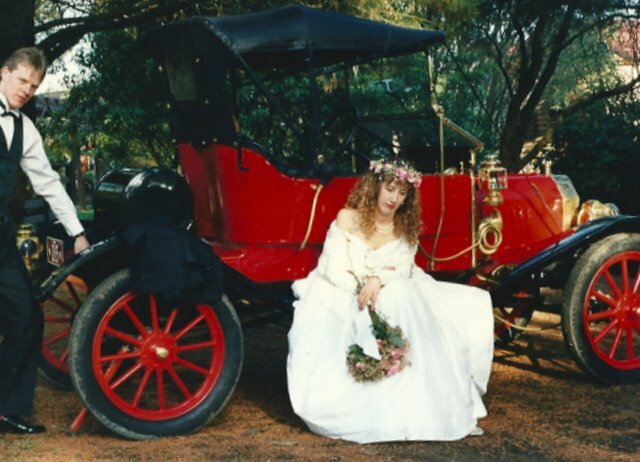 Also I am going to start getting pictures of the Bride IN WEDDING DRESS pretending to crank the T.
I had this one taken on my wedding day 20 years ago in the new year. It was meant to replicate that well known picture on the front of Bruce's book. Not even close but it was fun anyway! It was a great day, as most weddings are. We even made a silent movie in black and white. I will try to upload it on youtube when I get a chance. Good luck with the wedding and pictures! Lorentz, that image of you two on that great day has made many people smile. Would love to see the movie. Some of them would also fit into "trash the dress" type photos. Jim, that was fun. Wonder where that was shot? 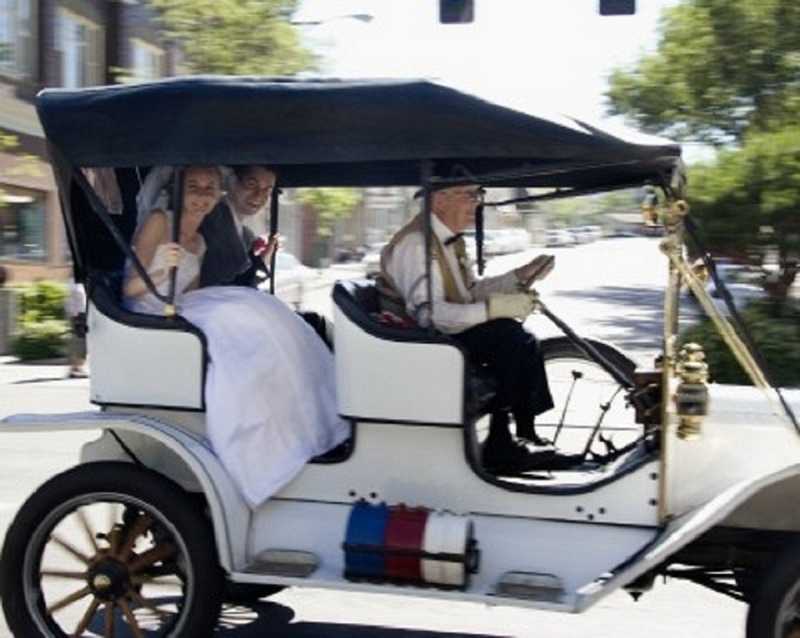 The video is posted on the Model T Club of Argentina web site. Maybe it was shot in Argentina.